Sue, a small business owner, crafted long, descriptive blogs to describe her business services and related products. She felt that she was doing an excellent job of convincing her readers to patronize her business. And yet, month after month, her blogs received a lukewarm reception. Data showed that many readers spent only a few seconds on each blog page, meaning they did not even finish reading what she had to say. Her blog posts received few likes and comments on social media, and none of her customers seemed familiar with her content. Sue was writing blogs, but few of her prospects were actually reading and appreciating them. When crafting her content, it’s likely that Sue failed to consider these six critical elements of effective communication. 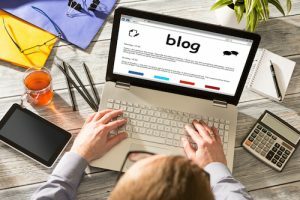 Remember, you’re asking your prospects to give you a few moments of their time, so you must be careful to create blogs that entice them to do so. Use these six strategies to get your prospects’ attention. Keep it brief. Every day, your average reader scrolls through social media news feeds, reads Twitter posts of 120 characters or less, and channel surfs the television. They are accustomed to being in control of their content, and anything overly long or complicated will often bore them. Speak to the average person. Unlike you, your prospects are not experts in your field. Avoid industry jargon or overly complicated examples. Consult with an “average person” (who is outside the industry) if your blogs make sense to them. Use a conversational tone. Your blogs should read as if you’re talking directly to your reader. This isn’t the time to write a formal research thesis. Focus on the benefit to them. You won’t convince anyone by simply bragging about your expertise or talking about your products. Explain how your products or services will improve your readers’ lives. Appeal to their emotions. Obviously, you don’t want to get too melodramatic, but use your writing to speak to your prospects’ emotions. Choose vividly descriptive words that convey strong emotional undertones. Be specific. Rather than wax on philosophically about why they need your services, demonstrate to your prospects precisely how your services can help them. Give specific examples or statistics relating to problems and solutions. You can even tell stories about past clients (with their permission, of course, and changing names for the sake of privacy is a good idea). At all times, remember that the point of your online marketing strategy is to demonstrate your value to your audience. How you discuss that value represents you as a business person, and creates a strong impression in the minds of your prospects. Make sure that each blog you publish accurately represents the image that you want to present. For more information on blogging or digital marketing strategies in general, contact us and we’ll be happy to answer your questions.